Akimenko Meats strives to bridge the gap between the city dweller and our local farmers. Our commitment to our neighbors is to bring in local, organic, and sustainable products while supporting the local agricultural community, building customer awareness, and ultimately aiding our local economy. Akimenko Meats will deal primarily with whole animals from farms located in a 250 mile radius of the Boston Area. To help make Akimenko Meats more sustainable we will offer house made charcuteries and stocks, making use of the entire animal. Our ultimate goal is to make local and sustainable meats available year-round to all members of the community. Akimenko Meats does not believe that eating with an ethical conscience should be a privilege that only the wealthy can afford. Our customers will engage with our butchers, discussing what they are planning to prepare or cook and why. This conversation allows for suggestion, customer education, and a deeper connection to our food supply and our local purveyors. The slow food movement has helped foster a culinary renaissance in the U.S. With this community-focused butcher shop we seek to bring its ideals and ethos to all. 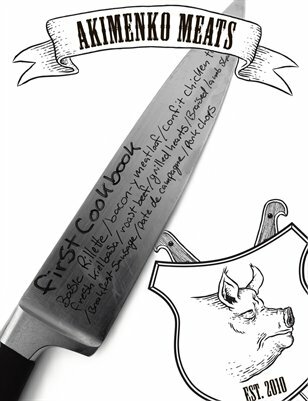 Proceeds from the sale of cookbooks will contribute directly towards assisting in the launch of Akimenko Meats in Winter 2010.